Lady Gaga fans and fashion blogs alike are raving about the impending launch of Eau de Gaga, the singer's latest fragrance venture. What caught my eye, however, is the notable similarity between the singer's fragrance bottle and the those of Tom Ford's Private label. Eau de Gaga also bears some similarity to Ford's Black Orchid fragrance, which bears a nearly identical color scheme and gold name plaque. Despite such similarities, the launch of Gaga's fragrance very well may be free of legal complications, as Tom Ford (or better yet, Estee Lauder) does not appear to have a significant amount of legal protection extending to the design of his fragrance bottles. No federal trade dress protection. No design patent protection. Given the fact that fragrances play such a large role in the Tom Ford business in terms of branding and the bottom line (the company was slated to hit sales of $1 billion this year, according to an estimate from the designer last year), the lack of federally registered legal protection is surprising. A bit about branding: After leaving Gucci and YSL, where Ford served as creative director for a decade, he launched Tom Ford International. Ford's first big projects under his eponymous label came in 2005, when he announced two global licensing deals; one with Estée Lauder for fragrance and beauty, and another with Marcolin for eyewear. Of these deals, both of which come with multi-million dollar budgetary commitments by the licensee to advertise the product lines, BOF wrote: "These global campaigns, which Ford directed and oversaw himself, would give further visibility to the Tom Ford brand and help to reach a vast consumer base from day one." Ford, who was not producing any garments under his eponymous label at the time, had a very strategic reason for licensing his name: “I realized that [the licensing deals] would keep my name very public, [so] that if I chose to go back into fashion it would even make my name bigger." As we know, he did eventually return to fashion, launching his menswear and womenswear collections in 2007 and 2010, respectively. With this in mind, the fragrances and their corresponding global ad campaigns have been a key force in the branding of Tom Ford, and this is an aspect of the brand that Ford takes seriously. He is, after all, a branding genius. He told BOF last year, “I’m used to designing a world because even as I was thinking of the perfume bottles, I was [already] thinking about how would they look in our packaging, how would they look sitting in our case lines, how they would look next to each other. So everything has a cohesive look which is what gives a brand a personality.” In this way, the fragrances (their scents, their campaigns, their packaging) play a meaningful role in the world of Tom Ford, and as a result, it is surprising to discover that the legal teams at Ford or Estee Lauder (as the creator of quite a bit of the Tom Ford BEauty IP) has not done more to ensure that their appearance is protected. This is especially interesting because unlike other brands that vary their packaging between fragrances, the vast majority of Ford's fragrance bottles, especially those in the Private Blend collection, share the exact same shape and overall appearance (a rectangular bottle with a gold plaque bearing the name of the brand and the fragrance and a shapely square lid). Variations on this formula have been introduced periodically. For instance, the Neroli Portofino collection (below, right) is packaged in a turquoise bottle but bears the brand's signature bottle/cap shape and gold plaque. A bit about the bottom line: Cosmetics giant, Estee Lauder, as the Tom Ford Beauty licensee, handles the manufacture, marketing and sales of Tom Ford's Signature and Private Blend collections, and while the exact figures of the licensing deal are not readily available, it is safe to say it is a noteworthy source of revenue for both companies. According to sources, licensees pay royalties to the licensors that are said to amount to anywhere between 5 and 15% of profits from sales of the licensed product. However, the terms of the deal between Estee Lauder and Tom Ford could vary quite a bit. In exchange, the licensor (Tom Ford, in this case) grants the licensee the right to use its trademark(s). If we look to Estee Lauder's fiscal report for the year ending on June 30, 2013, the cosmetics company reported that "sales of Jo Malone and Tom Ford fragrances contributed approximately $60 million, combined." It reported an annual revenue of $10.2 billion for that period. This certainly suggests that Estee Lauder is profiting somewhat significantly from the Tom Ford deal. 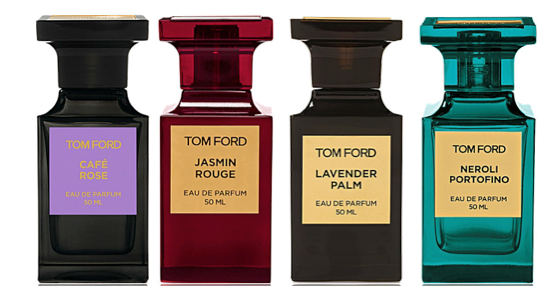 Considering the gains that both Estee Lauder and Tom Ford derive from the fragrances, it is surprising that more of the bottle designs are not subject to legal protection. While it is worth noting that the bottle and cap designs for a handful of Ford's signature fragrances, such as Black Orchid, Violet Blonde, Velvet Orchid, and White Patchouli (pictured below), are subject to design patent protection, those patents do little to protect the Private Blend bottle design. Despite the fact that nearly all of Ford's fragrance bottles bear a similarly-placed gold plaque, the design patents for the Ford fragrances (D549,582 and D545,208) do not extend to the plaque itself, but instead, to the overall shape of the bottles/caps themselves. (This is not to say that any brand can copy the exact wording from the plaques and recreate it on their own fragrances. That would certainly amount to trademark infringement). Moreover, the federal trademark protection that extends to the fragrance names (think: Black Orchid, Urban Musk, Arabian Wood, Bois Marocain, Sahara Noir, and Shanghai Lily, among others) does not protect the appearance of the bottles of the corresponding fragrances. It is worth noting that some other fragrance bottles share the plaque detail. Chanel, Dolce & Gabbana, and Salvatore Ferragamo, among others, have all utilized the gold name plate on bottles of varying shapes. With this in mind, it may simply be that Estee Lauder (the company that most likely created the Private Blend bottle design) could not obtain protection for the bottle design, as designs that are very similar already exist. However, given the significance that the fragrances play in the grand scheme of things for Ford, as I mentioned above, I do not think it would be a stretch to assume that if this was the case, Estee Lauder would tweak the appearance of the bottle in order to meet the level of novelty required for protection to apply. So, what does all of this mean for Lady Gaga and her fragrance licensee, Coty? It seems to indicate that they can debut the Eau de Gaga fragrance without legal complications. Any issues that arise from the fragrance, which appears to have been in the works for some time now, as indicated by the federal trademark registration that Gaga's IP holding company, Ate My Heart Inc., filed in October 2013 for the mark "Eau de Gaga," are more likely to be for Ford. Given the rather noticeable similarity between the two brand's bottles, Ford potentially stands to lose any distinctiveness it may have gained in connection with the design (if there is any distinctiveness there to begin with). If Lady Gaga's last fragrance, Fame, which is reportedly on its way to making fragrance history with the number of bottles sold worldwide, is any indication, Eau de Gaga will be making its mark and thereby, potentially encroaching on the turf of Tom Ford's most high end collection of fragrances, at least in terms of appearance. Thoughts?